When the eye ages, and cataract develops, an early and frequent problem is from straylight deterioration. 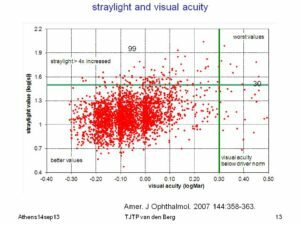 Straylight causes problems not explained by visual acuity loss, such as with driving at night, facial recognition, hazy vision, etc. 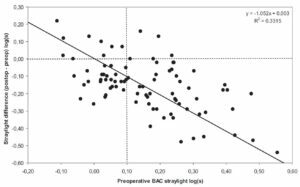 Straylight must be taken into account for proper objective indication for cataract surgery. It is well recognized that in traffic, on the road, in the air, or on water, glare can be a safety issue. 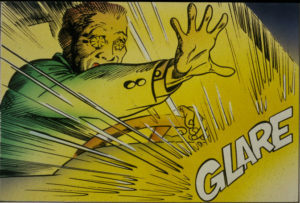 Straylight has been accepted by international agreement (Vos&vdB1999) as the defining quantity for disability glare. Licensing regulations often include glare sensitivity demands, and straylight is the gold standard manner to test for glare sensitivity. 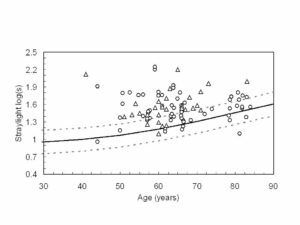 Surprisingly, refractive surgery does NOT on average make straylight worse, whereas in a small percentage of cases straylight does deteriorate, corresponding clinical findings, such as haze, folds, interface debris, etc. Speculatively, the overall favorable effect has been attributed to the relief from ill-tolerated contact lenses. For a full listing of clinical straylight studies please see the 2013 survey.